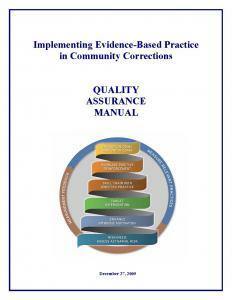 "This manual provides a simple and straightforward approach to implementing evidence-based practice" (p. 3). This manual explains: quality assurance plan development; peer review; quality assurance indicators; customer satisfaction; program evaluation; and individual performance measurement. Samples of pertinent forms are also included.